After being asked to talk, me and SonicTHD decided to talk a bit on the lore of FNaF. There will hopefully be another discussion going up soon, but this one came first, so I’m posting this one! SonicTHD is fairly fluent in English, but has said he’d like the spelling fixed in some places. I’ve tried to not change his points while doing so. [22:09:35] Kizzycocoa – ok, so let’s start. [22:10:17] Kizzycocoa – so, lets go to the drawings. What’s the theory you’d like to discuss? [22:11:55] Kizzycocoa – Ah, I see. You think there is a discrepancy between my theory, and the phone calls? [22:12:07] Kizzycocoa – to be clear, that would be This Observation? [22:12:51] Kizzycocoa – Ok, I love to discuss and poke holes in theories. What do the phone calls say that refutes the observation? [22:13:16] SonicTHD – Well, we know about that famous theory which says the phone calls are pre-recorded, right? [22:17:18] Kizzycocoa – it presumes the phone calls were part of the older location, I believe? [22:17:57] SonicTHD – The Drawing Theory (I like to call that) talks about the old opening of FNaF 2 location had the Originals (It’s how I like to call the Un-Withereds), Funtime Foxy, Puppet and Jay Jay, right? [22:20:08] SonicTHD – What do you mean? [22:21:15] Kizzycocoa – I don’t believe the Phone Call theory is right at all. [22:21:26] Kizzycocoa – Shall I elaborate on my issues with that theory? [22:21:42] Kizzycocoa – Ok, so I will take 3 issues. [22:22:09] Kizzycocoa – First off, the “older models” in the back-room. Obviously, with the older models in use, there’d not be multiple older models. [22:23:11] Kizzycocoa – that’s my first worry. [22:23:19] Kizzycocoa – my second is, the night 6 phone call. [22:23:34] Kizzycocoa – because we know, the night guard switches between 6 and 7. [22:23:59] Kizzycocoa – but, my third issue – I believe – destroys that theory. [22:24:02] Kizzycocoa – the murdered kids. [22:25:06] Kizzycocoa – it is heavily implied to be the discovery of a murder. [22:26:49] Kizzycocoa – There is naturally the chance that Phone Guy is describing a separate event, but Id’ ask, what event could that be? [22:27:11] SonicTHD – The first? [22:27:49] Kizzycocoa – Not likely. They died in the first location that was “left to rot”, with the withereds that they tried to refurbish, but the smell lingered. [22:28:01] Kizzycocoa – they were dead before the FNaF2 location opened it’s doors. [22:30:36] Kizzycocoa – I’d like to pre-empt an argument. Are you going to go on and say the FNaF2 location is the sister location to Fredbear’s, mentioned in FNaF3? [22:31:32] Kizzycocoa – Ah, good. good. [22:32:11] Kizzycocoa – Like, literally 6 characters. [22:32:40] Kizzycocoa – so, I’ve laid out my reasons. Where were we going after this? [22:33:09] SonicTHD – What do you mean? We finish the topic or we could talk more about this? [22:33:57] Kizzycocoa – so, we’ve established that, and I fully agree. so….where is the conversation going now? [22:34:25] Kizzycocoa – well, is there anything else to that? [22:36:12] SonicTHD – Why he would talk about that if probably that location closed in 85, which the last opening of FNaF 2 is in 86? [22:38:03] Kizzycocoa – Well, for me, I’d reference the Bite of 87. [22:38:08] Kizzycocoa – I still believe Mangle caused the bite. [22:38:34] SonicTHD – Because he said “the animatronics walking during the night”? [22:38:48] Kizzycocoa – yes, especially since in FnaF2, they can walk around during the day. [22:40:19] Kizzycocoa – Well, let’s also recall that it was the very next day. They likely didn’t have all of the information. [22:41:01] Kizzycocoa – which is unlikely. [22:41:59] Kizzycocoa – I see. I suppose that’s our first area of disagreement then. I don’t believe that at all! [22:42:06] Kizzycocoa – sure thing, we can switch to that! [22:44:12] Kizzycocoa – of course, removing all the protections, which they replaced with the empty head. [22:45:41] Kizzycocoa – sure thing! [22:46:15] Kizzycocoa – I see. so this other topic is not a third topic? [22:46:53] Kizzycocoa – oh wow, we’ve doubled the workload! [22:49:01] Kizzycocoa – I see. Well, it’s about timing I suppose. I’ll be posting an observation on it soon enough. [22:49:22] Kizzycocoa – But, it’s the simple question of, were the Springlock suits retired by FNaF2? [22:52:38] Kizzycocoa – long and short of my argument is this. when the Springlock suits were retired, they were never used again for entertainment, correct? [22:53:22] Kizzycocoa – ok, so, can we agree that, during FNaF2, the FNaF1 location is abandoned? [22:53:41] Kizzycocoa – so, when was Spring Bonnie sealed in the safe room? [22:53:54] Kizzycocoa – it has to be before or after. [22:54:15] Kizzycocoa – I would agree. But see, when they were locked away, all Springlock suits were retired. [22:54:53] Kizzycocoa – so, how could they be retired in 84, yet you believe the minigames in FNaF4 take place in 87 – 3 years after they’ve been retired? [22:56:29] Kizzycocoa – remember the phone call, the incident took place in the sister location. [22:56:39] Kizzycocoa – AKA, both locations had to take down the animatronics. [22:57:05] Kizzycocoa – so, that includes Fredbear, which would be the sister location where the Springlock incident took place. [22:58:19] Kizzycocoa – so a Springlock incident at Fredbears caused the FNaF1 location to retire their Springlock suits. Why would you presume Fredbear’s – the source of the Springlock incident – would not retire their suits? [23:04:36] Kizzycocoa – Yes, though let it be known, FNaFLore is neutral. [23:05:30] Kizzycocoa – I plan to try to remove all doubt with the observations. [23:05:40] Kizzycocoa – but, until then, I won’t pander to either side. [23:09:38] SonicTHD – First the Toys figures: The Toys figures for me couldn’t existed before 87, don’t makes sense a lot the animatronics been based on inaccurate toys. Well could be, because the plushies are actually like the Classics and not like the Originals, which makes sense. But there is two things which prove more this: Chica’s Beak teaser and Funtime Foxy figure. 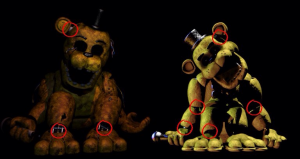 Well, the Chica Beak could be a hint made by Scott for prove the game is in 87, and of course, be a answer to Matpat about the red things like you said before. But Funtime Foxy figure don’t makes any sense if is in 83, because the Toys could be inaccurate like the plushies, but Funtime Foxy figure is totally different to Original Foxy, why they would do that? Just if Circus Baby had a old location before, different to the new game location. [23:10:58] SonicTHD – Second: The teasers. 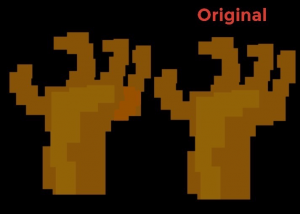 Every teaser had a 87 on the HTML’s, and the secret 87 in Nightmare Foxy why, which can be a reference to the brother seen the bite. The only teaser which had 83 in the code was Plushtrap teaser. Why would Scott put the 87’s? [23:11:36] SonicTHD – Third: Was It’s Me phrase, which can be a obvious reference to the bite of 87. [23:13:02] Kizzycocoa – ok, so, lets go through these. First off, “It’s Me” is a reference to the FNaF1 location, and seems tied to Golden Freddy, not Fredbear. [23:14:39] SonicTHD – Well, what’s your opinion about it? [23:23:19] Kizzycocoa – it was link=”#2093″, which would make it 1982. [23:23:38] Kizzycocoa – I think it may have referred to the opening time. 19882-1983. [23:23:59] Kizzycocoa – I don’t think we can rely on them as 100% proof. [23:24:15] SonicTHD – What’s exactly a red herring? [23:25:12] Kizzycocoa – get it? [23:25:52] Kizzycocoa – I was so pissed when I found out that. [23:26:06] Kizzycocoa – it means nothing. [23:26:51] Kizzycocoa – the problem is, the Summer Job. 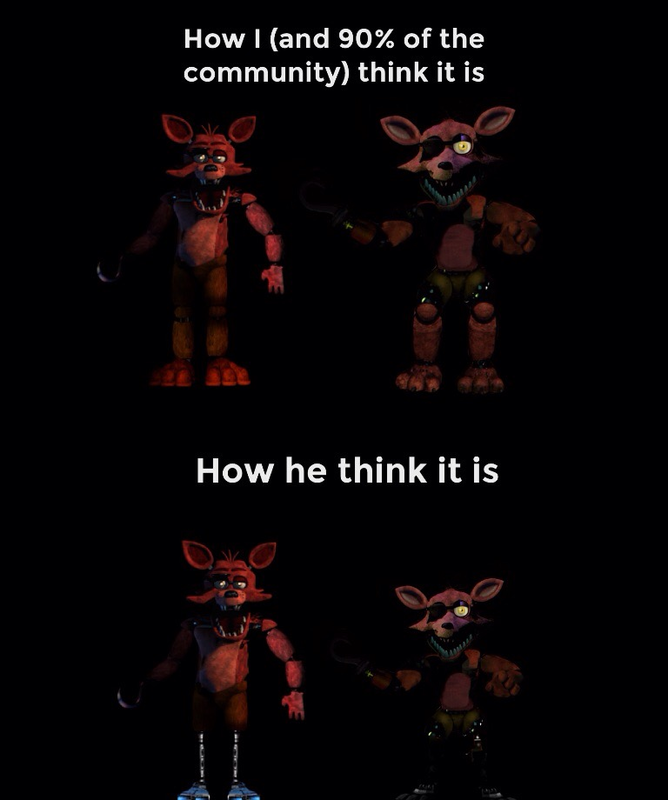 [23:30:08] Kizzycocoa – what’s this about Funtime Foxy? [23:30:28] Kizzycocoa – in the FNaF4 bedroom? [23:30:45] Kizzycocoa – again, the drawings. [23:31:22] Kizzycocoa – if they had new toys, why were they pushing the old plushies at relaunch? [23:32:04] Kizzycocoa – we can’t count them as canon, really. [23:32:22] Kizzycocoa – but why not on the shelves? [23:32:56] Kizzycocoa – again, as he was replaced. [23:35:22] Kizzycocoa – I’d bet, no-one. [23:35:23] SonicTHD – Who you think he possess? [23:35:32] SonicTHD – Hmm why? [23:37:27] Kizzycocoa – and his soul somehow left Fredbear’s, found the FNaF2 location and possessed a paper plate? [23:38:05] Kizzycocoa – impossible. by this point, the Puppet exists. [23:38:39] Kizzycocoa – but The Puppet was already possessed. [23:42:48] Kizzycocoa – so, who possessed them? [23:48:05] SonicTHD – What do you think? [23:49:32] Kizzycocoa – I suppose, but this is wild, wild speculation. [23:49:46] SonicTHD – A lot, but could be a possibility right? [23:50:10] Kizzycocoa – it could be possible, but as Scott says we have all the information we need to solve this,I find it highly unlikely. [00:42:00] Kizzycocoa – so, what should we tackle next then? [00:42:20] Kizzycocoa – as in, the origin of the shadow animatronics? [00:42:28] SonicTHD – So, remember what I said about Paper Pal Freddy and Paper Pal Bonnie straw-gaspping? [00:42:50] SonicTHD – About a secret murder of two kids in Fredbear’s V2? [00:44:26] SonicTHD – But and the murder of Puppet kid? [00:44:42] SonicTHD – Or the first five murders, wasn’t him before FNaF 2? [00:45:53] Kizzycocoa – clearly, their motives are good. [00:47:03] SonicTHD – Could be this when the shadows died and the Springlock incident is the same of the buck? [00:47:36] SonicTHD – But there is any chance to the Springlock incident be the same of the book? [00:48:22] SonicTHD – What do you mean? [00:52:38] SonicTHD – What do you mean? [00:52:58] Kizzycocoa – the tapes found in fnaf3 weren’t around the puppet murder era. that happened before that time. [00:53:27] SonicTHD – But before don’t existed Freddy, right? 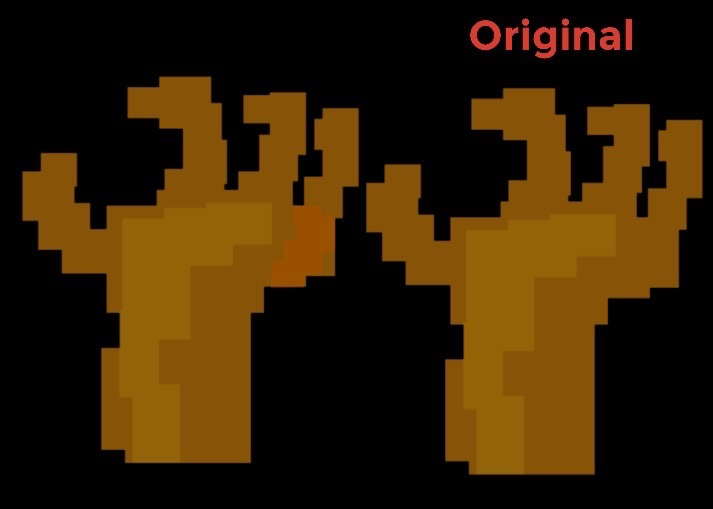 [00:54:03] SonicTHD – FNaF World don’t confirmed Fredbear was the first? [00:54:40] Kizzycocoa – really, we have little to no info tbh. [00:55:44] SonicTHD – which is before Stage 01…. [00:55:51] SonicTHD – Because Spring Bonnie…. [00:57:30] SonicTHD – What do you mean? The Give Cake bear? [01:03:39] SonicTHD – The cartoon isn’t technically a evidence? [01:05:38] SonicTHD – So existed a Golden Bonnie? [01:07:35] Kizzycocoa – what bonnie is Springtrap? [01:07:51] Kizzycocoa – from Fredbear’s? 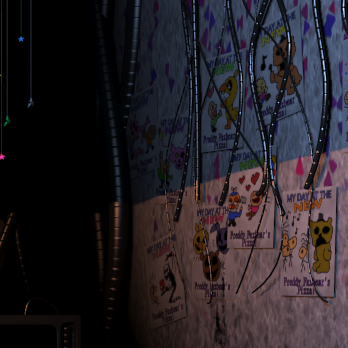 [01:08:16] Kizzycocoa – and we can agree, golden Freddy is also in the fnaf1 location? [01:09:24] SonicTHD – You never noticed that? [01:09:41] Kizzycocoa – why would we have a half-Springlock generation? [01:09:49] Kizzycocoa – spring bonnie, and normal golden Freddy? [01:11:11] Kizzycocoa – why do you think he replaced spring Freddy? 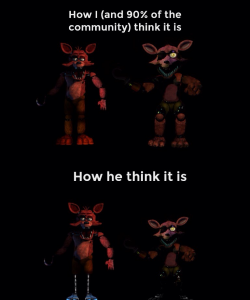 [01:11:22] Kizzycocoa – why is he not spring Freddy himself? [01:11:34] Kizzycocoa – but why would spring bonnie exist at that time then? [01:11:38] SonicTHD – What do you mean? Like he was upgraded? [01:11:59] SonicTHD – Like what happened to the Withereds to be the Classics? [01:14:16] Kizzycocoa – I’m sorry, but I just can’t get behind that idea. I feel it must be a spring animatronic. [01:14:56] Kizzycocoa – it is very straw grasping. [01:15:05] Kizzycocoa – I just, don’t understand it, and can’t get behind that. [01:16:46] SonicTHD – What do you mean? [01:17:02] Kizzycocoa – it doesn’t look like a Springtrap head. [01:17:03] SonicTHD – Yeah I know, what he means? [01:17:38] SonicTHD – So, you mean New Spring Bonnie was from a location with Original Golden Freddy? [01:21:49] Kizzycocoa – Well, do we know if Fredbear has 5 fingers? [01:22:51] Kizzycocoa – hidden, where? [01:22:52] SonicTHD – Can I send a image here? [01:24:43] Kizzycocoa – see how he shows the different finger colours here? [01:26:05] Kizzycocoa – why not? [01:28:11] SonicTHD – But, this is a costume right? [01:28:20] SonicTHD – Not a robot? [01:28:36] SonicTHD – What do you mean? [01:28:45] SonicTHD – About Mickey or Fredbear? [01:29:32] SonicTHD – Possibly the animatronics aren’t Springs? [01:29:43] SonicTHD – They could be costumes or something? [01:30:06] Kizzycocoa – I don’t get how you’re connecting these to the endo 02 model. Why are you connecting them to that model? [01:31:51] SonicTHD – So it’s a new Spring Endoskeleton? [01:32:16] SonicTHD – which isn’t a “Spring”, and uses a new technology for wear the suits? 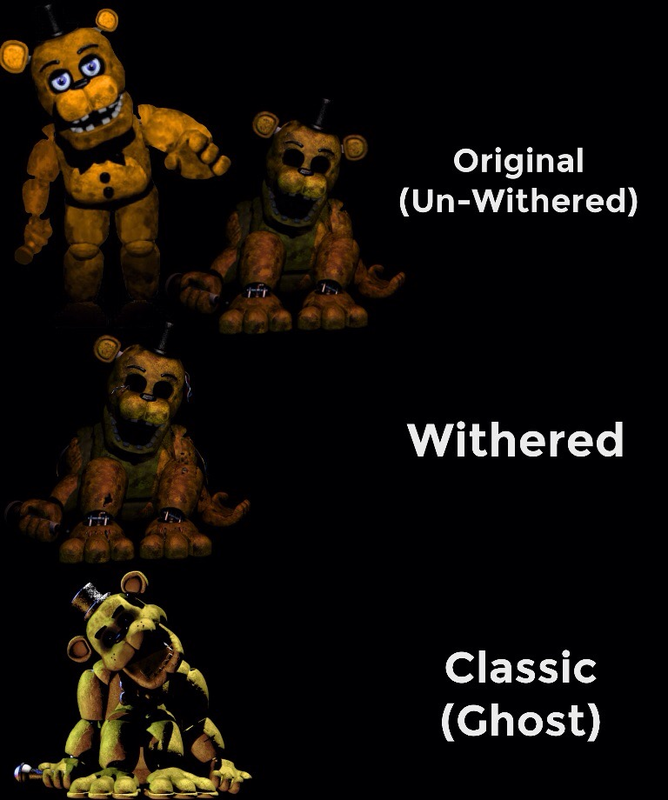 [01:32:52] SonicTHD – You mean the model of the Endo of Withered Golden Freddy or the Endo-02 is his endo? [01:32:54] Kizzycocoa – who’s endoskeleton is endo02’s, otherwise? [01:33:11] SonicTHD – The second? 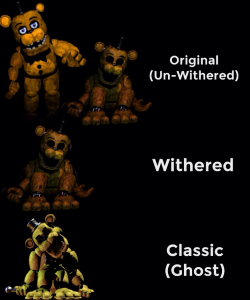 [01:33:25] SonicTHD – How if Withered Golden Freddy has a endoskeleton? [01:37:56] Kizzycocoa – I don’t know entirely. [01:38:52] SonicTHD – So, is possibly the Springlock incident is after the Puppet murder, no? [01:44:02] SonicTHD – If existed the Original Five before Stage 01, why the minigame is called “Stage 01”? And why literally exists Stage 01 restaurant with Spring Bonnie, Spring Freddy and Golden Cupcake? [01:44:22] SonicTHD – I mean, Stage 01 name means “the first stage of Freddy’s”, right? [01:45:13] SonicTHD – Also why exists Spring Freddy and Spring Bonnie in this stage, why the original five should still there? [01:49:10] Kizzycocoa – that is completely unsubstantiated. [01:49:30] SonicTHD – So, how it’s your timeline exactly? [01:51:20] Kizzycocoa – again, early fnaf, I’m not sure which came first. [01:51:43] Kizzycocoa – let me think a bit. [01:55:38] Kizzycocoa – due to the comics, Fredbear etc. had to exist first. [01:56:45] Kizzycocoa – the location is left to rot, while Fredbear continues. 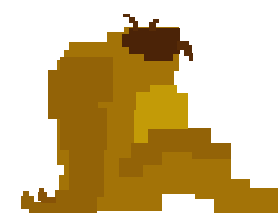 [01:58:38] Kizzycocoa – then the first launch of FFP2 happens, during which, the Fredbear Bite occurs. [02:00:21] SonicTHD – What do you think he is, a ghost or a suit? [02:01:04] Kizzycocoa – both. I feel he is a suit that was possessed, but is in suit mode, so can only “project” himself via haunting. [02:05:36] Kizzycocoa – not really. [02:05:51] Kizzycocoa – he had to exist. [02:07:28] SonicTHD – Can I explain? [02:08:55] SonicTHD – You know good and bad ending right? [02:10:41] Kizzycocoa – but then, where is Fredbear’s head? [02:11:02] Kizzycocoa – like classic GF’s head? [02:12:03] Kizzycocoa – I don’t understand what you mean? [02:12:49] Kizzycocoa – this brings the count to 3 golden Freddy variations? [02:13:55] Kizzycocoa – sorry, you’ve completely lost me. [02:17:24] Kizzycocoa – that’s how it’s meant to look? [02:17:32] SonicTHD – What do you mean? [02:24:41] Kizzycocoa – classic = unwithered, though the suit is not at the FNaF1 location. it is likely in police custody. [02:26:55] SonicTHD – Do you agree with that? [02:27:08] Kizzycocoa – what leg suit part? [02:33:17] Kizzycocoa – OH, I see. [02:33:30] SonicTHD – Do you agree with this? [02:34:14] SonicTHD – Do you think they’re real? [02:38:05] SonicTHD – Do you believe the Phantoms could be the ghosts of the Toys? [02:39:05] SonicTHD – What do you think he is? [02:39:24] SonicTHD – Shadow Freddy representation? The bite? Golden Freddy? 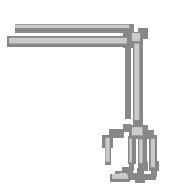 puppet? [02:39:50] Kizzycocoa – I’m not too sure. 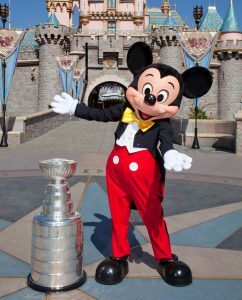 I’d say he represents seeing an employee in a suit in the backroom. [02:41:35] SonicTHD – but if he is Shadow Freddy, why he would be him? [02:45:10] Kizzycocoa – yeah, it’s getting late. it’s like, 2:45AM here! [02:45:38] Kizzycocoa – ok, so I’ll end on two other questions! [02:45:42] SonicTHD – It’s was a awesome discussion! [02:45:50] Kizzycocoa – if you could ask Scott one question, what would it be? [02:48:23] Kizzycocoa – ok! well then, I guess there’s a second question. I believe you make theories regularly. Where would people find these theories? [02:51:38] SonicTHD – I loved talk with you too!